Cooking with a grill rotisserie can greatly enhance your grilling skills. Large roasts like leg of lamb, whole poultry, tri-tip and pork loin can be difficult to cook well on a grill. If you are experienced with indirect heat grilling techniques you can have a lot of success. However, even with just little know-how, a barbecue rotisserie makes cooking these types of larger meat cuts a snap! What is so great about a rotisserie? For one, it is less work. Once set up, you just let the motorized rotisserie do the work or turning the meat over your heat source for you. You can close the lid and sit back and relax, only occasionally checking to baste the meat or check the doneness. It also helps make sure that the roast is cooked evenly so that no part of the surface burns and so the interior is evenly cooked, remaining succulent, juicy and flavorful. With a grill rotisserie, no more dried out, leather-like meat! 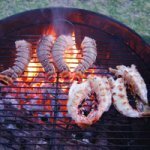 These tips apply not only to cooking on a grill rotisserie but also to cooking on a fire pit! If you can rig up or buy a rotisserie that fits over your outdoor fire pit then you can use the same techniques over your real hardwood fire. Prepping Your Food for Grill Rotisserie Cooking: All sorts of roasts with various recipes can utilize rotisserie cooking to attain culinary perfection. There are no rules about which types of marinades or preparations you can use. 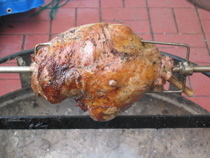 Basically, if you are cooking a large roast on a grill or fire pit, a rotisserie will help. After preparing, marinating and/or seasoning your roast as per your liking (or per the recipe you are following) you simply need to secure your roast to the rotisserie spit. You will need something to hold the meat to the spit so that it turns evenly as the spit rotates. Most rotisseries come with spit forks which are the moveable pair of prongs that slide onto the spit, as pictured in the above photos. 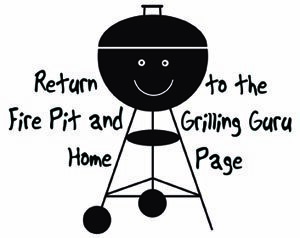 First, place the first fork on the grill rotisserie spit with its prongs facing toward the middle of the spit. Then skewer the roast through its long axis with the spit and position the roast roughly in the middle. Then slide the second spit fork on the end with its sharp ends facing the meat. Slide the forks together as far as they will go, piercing the meat in several places if possible, to hold the roast securely in the middle of the spit. When you are happy with their position and the security of your roast, simply tighten the finger screws to secure the forks, and your meat, in place. Ideally, your roast and the spit should be tight so that they move as one unit. If the roast is loose or flops around as you move the spit, loosen the forks again and try to reposition them to get the best purchase on the meat so that it is secure. You can now hook the spit up to the grill rotisserie and turn on the motor and your food will rotate slowly and evenly over your heat source. Baste, Baste Baste! : While the interior of your roast has a lot of natural juices that will keep the interior moist if you grill rotisserie cook a roast slowly, the surface can slowly get dried out in the high heat. Basting with a basting brush and some basting mixture help to keep the surface moist. Even more importantly, it helps you to slowly develop a nice crust of richly flavored, caramelized seasonings on the surface of the roast which both looks great and tastes delicious! 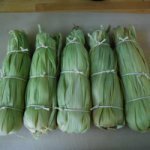 There are any number of basting mixtures that work beautifully depending on what you are cooking. Olive oil, wine, fruit juices, citrus and/or vinegar can all be combined with various herbs, spices, sugars and salt. Experiment a bit to find a basting mixture you like or find recipes for specific dishes you want to make. For example, I love leg of lamb basted with a mixture of lemon juice, white or rosé wine, olive oil, salt and pepper. Prepare a bowl of basting mixture ahead of time and make sure you have a nice basting brush, ideally a long one so that you don't get cooked yourself when trying to baste your meat! After your roast starts to get a bit of color and is visibly drying on the surface baste the surface liberally. Come back occasionally to add another layer as it dries up again. In this manner, you can slowly build up a nice rich rind of flavor that coats your whole roast. Not only does it help seal in juices and flavor but it is simply delicious. Keep that Lid Shut! : When grill rotisserie cooking ambient heat and smoke is your friend! With your lid open, only the underside of your roast gets cooked at any one time. All that ambient heat is lost! When you close your lid, the heat and smoke swirls around your roast by convection, more evenly cooking your roast from the outside in. Your food will be more evenly cooked, more tender and juicy and delicious. It will also cook faster. In the case of a fire pit a lid is generally not an option. This is usually okay because your heat source is large (an open hardwood fire!). As long as your rotisserie is centered over the heat the rising heat from the fire will envelope the roast pretty efficiently. Use a Meat Thermometer: With large roasts it can be hard to tell when the interior is perfectly cooked. While you will get experience with this and learn to eyeball doneness or test it by feeling the meat, a meat thermometer can help out a lot. Test the temperature in the deepest parts of meat when you think it is getting close. But be careful not to poke the meat too early or too often! Those big holes in the meat can leak juices from the inside, drying your roast out! Let Your Meat Rest: When your grill rotisserie cooked meat is done, don't just throw it on a plate. As with any other cooked meats give it a chance to rest. Lay the roast on a platter and cover in tin foil. For very large roasts you can let it rest up to half an hour or more. This gives the temperature and juices in the meat to equilibrate so that it is even and calm. This way when you cut the meat, you are sure to be giving your guests the most tender and succulent piece of meat possible! A rotisserie really helps your fire pit cooking repertoire expand. While cooking on a grill grate over a fire pit really only allows you to cook smaller pieces of meat, a rotisserie opens it up to all kinds of roasted meat. Because most fire pits don't have a good solid lid, indirect heat cooking is usually not an option. Therefore, a rotisserie is the best option to cook whole birds and other large roasts on an open fire. One key to making fire pit grill rotisserie cooking work is to be able to manage your heat. Ideally, find a rotisserie which can be adjusted in height somewhat. If you are cooking over an open fire, you don't want your food too close to the open flames. The flames will quickly burn the surface (particularly if there is skin or surface fat) which is not appetizing and will dry out your meat. You want the roast to cook in the hot rising air and smoke above the fire, not in the fire itself. So raise your rotisserie to whatever position gives you good heat, but no actual flames lapping up around your food. As you get more experienced you will learn tricks to getting just the right heat out of your fire. For one, burning your fire for a while before starting to cook helps to build a core of hot embers which give off a lot of ambient heat. They also don't have big flames so they are easier to control and prevent burning. You can lower your roast slowly as the embers die down and give off less heat. Stirring the embers with a skewer can help release more heat if the heat is fading and you don't want to add more wood. Just as with any grill rotisserie cooking, baste frequently and abundantly. It can make the difference between a good fire pit roast and a great one. 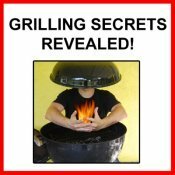 Done with the Grill Rotisserie page?